This started off as a one and done diary but got a bit wordy (as is my custom) so I had to break it into 3 parts. Part 1 and Part 2 have been and gone. Here is the rest. We resume proceedings at the end of the First Half. Half time – This time, with all the best intentions, we went searching for food of at least some nutritional value, however, you would be more likely to walk into a New South Welshman than to find food of such ilk. What is with that? The irony of not being able to find healthy food at a sporting event is never lost on me. This was pretty much the only thing I could find to complain about (although I may have mentioned the heat a few times) so that’s not too bad considering. Of course what I really felt like was a pie. Kick off – Still cautiously optimistic. Cows are still in the game so there’s that. Can’t believe there is only 40 minutes left in the season. Half this crowd is going to be very disappointed in 40 minutes. I’m hoping I am not one of them. I’m definitely hoping Old Mate beside me is going to be very disappointed. Although, given his age, he probably has never seen the Broncos win a premiership so we are on a level playing field. 43rd minute – Morgan is too slow in getting up in the tackle and gives away a penalty. Brisbane take the 2 again and Broncos are up 16-12. I think Coote and Granville have been the most improved players in the Cows line up this year but no-one in the NRL has come further in 2 years than Michael Morgan. Pre-season 2014 and he couldn’t even get a permanent spot on the Cowboys first XIII. Now he would be in the Australian squad, if Australia ever played. Anyway he has been well marked so far. 46th minute – Broncos are pressuring the Cows line and Matt Gillett is hit without the ball. No penalty. Cows get a 50/50. Maybe this is their night after all? 49th minute – The crowd has just been announced. 82,758. That is an impressive number and a fairly decent argument for not bringing the game to QLD. 54th minute – John Asiata is on the field and Lachlan Coote bombs for the corner. Corey Oates knocks it on and the Cows have another set of six on the line. You would be getting short odds on Corey Oates transitioning to the forward pack in the very near future. 56th minute – Another bomb by the Cows which is unfortunately knocked on by Justin O’Neill right on the line. Broncos goal line defence is very stout and I’m wondering whether the Cows can breach it. They are getting more ball this half but can’t seem to find the last pass. The Cows are looking a little bereft of ideas. Not 2010 bereft of ideas (which consisted of JT running across field desperately looking for runners for pretty much the entire game – surely JT deserves a premiership) but bereft of ideas none-the-less. 59th minute – Another repeat set for the Cows. Good kick from Thurston. 64th minute – OH NO PART 2!! Lachlan Coote is through a half gap but he rolls over and reaches for the line which is a clear double movement. So frustrating. Time is starting to run out now and the Cows keep squandering opportunities. Beginning to feel numb all over. It might be my body still thinks I am in Brisbane. It could be because the Cows could go 100 years before nabbing a premiership. I can’t tell which one it is. 67th minute – Couple of more Cowboys sets on the Broncos line but it remains impervious. Kane Linnett knocks on again. If the Cows lose he is going to need a lot of therapy. If only their naming rights sponsor was a psychiatrist and the Cows played at 1300 THERAPY Stadium. I know their fans could certainly use a therapist. Right now. Time continues to slip away. 69th minute – Broncos scarper up the field and get a repeat set after a well-placed kick from Ben Hunt. 70th minute – Broncos waste their opportunity to seal the game. Oates knocks on again. 73rd minute – Cowboys are trying everything but Ben Hunt makes a counter attacking half break and Broncos are a chance of getting that clinching try. A Milford chip kick is defused by none other than JT. He is everywhere on the field. It is like there are 6 of him. 75th minute – Broncos take another tame set and kick for the sideline. This strategy is letting the Cows have a number of free swings at them but so far the Cows have got nothing. Time almost gone now. I can’t believe it is playing out this way. 77th minute – Literal repeat of the last 10 minutes. Cows throw everything at the Broncos. Nothing comes of it. Broncos roll 5 straight hit ups and then grubber for the sideline. Cows run to the scrum (not fast enough for my liking). Broncos walk. Fans are going bananas from both sides. Cows fans trying to rally them for one last strike. 77th minute – Kane Linnett is upended in a really bad spear tackle. He is having a terrible night. Ben Hunt has given away a penalty and the Cows will set up from great field position. Still can’t believe we are seeing spear tackles. The game has been played in good spirit and the spear tackle was absolutely out of the blue. Surely this must be the last chance for the Cows. 79th minute – Cows are almost punching through the line on every play but Broncos are holding on grimly. Time almost completely gone now. Crowd still going crazy. Can’t believe the Cows are going down like this. Cows have wasted the set with a very tame kick. It is all over. Old mate beside me (who has been conspicuously quiet during the second half, probably because his bed time is normally 6:00pm) suddenly is piping up again. He’s giving it to me. Fair enough. 80th minute – Broncos just have to hold onto it and they have won but there is a strip and the Cows have the ball back. Time for one last play. Thurston is running around like a crazy man and has virtually no options but somehow he finds Morgan with space. Morgan is free on the right and sprints into the heart of about a million defenders and somehow finds Feldt on the edge. TRY! TRY! TRY! TRY! TRY! TRY! TRY! TRY! TRY! TRY! TRY! TRY! TRY! TRY! TRY! TRY! TRY! TRY! TRY! TRY! TRY! TRY! TRY! TRY! TRY! TRY! TRY! TRY! TRY! TRY! TRY! TRY! TRY! TRY! TRY! TRY! TRY! TRY! I’m looking at the heavens and expelling about 750,000 decibels of volume to the Olympic Stadium roof. I hug Mrs TGOS which in itself is a miracle given my position on PDAs. Every Cowboys supporter is on their feet. I don’t even rub it into Old mate because I’m the bigger man. No, I’m literally the bigger man by about 15 times. Plus I think he is crying. I can’t believe the Cows just scored and JT will kick for the win. The feeling is very surreal. I’m not a betting man or a billionaire, but if I was both I would be putting a lazy million on JT kicking this over for the win. Thurston’s conversion – This is taking a million years and I don’t care a hoot. JT can take till Tuesday to put this one over and I wouldn’t care. It seems like he has to kick this. The whole year has been leading up to him kicking it and then immediately retiring and being appointed Governor-General. It just feels like that kind of moment. He strikes it and for a second it is nearly impossible to work out what has happened, mainly because I’m in row 1000, but it is immediately clear that it missed. And that is why I’m not a betting man. We are going to golden point. Golden Point – Just feels like the Cows will win. They’ve pretty much been peppering the Broncos line for the entire second half but there is always part of me that knows either side can get a drop goal. 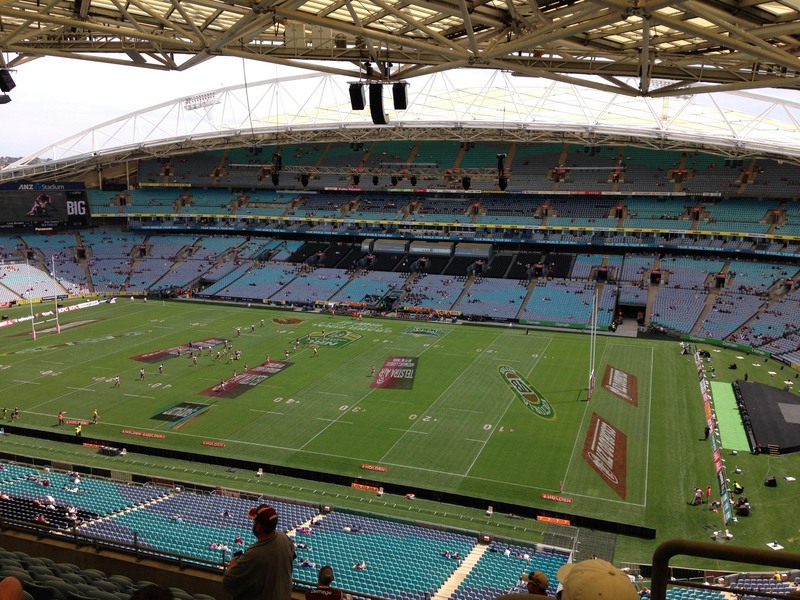 Kickoff – Kyle Feldt kicks off again and it is a high one and then OH NO PART 3! Ben Hunt has dropped the ball! Unbelievable. Everyone in the stadium feels sorry for him immediately but it has actually happened. Surely the Cows couldn’t lose now. Cows scrum feed right on the Broncos line. They pack the scrum and the defence stops a Thurston drop goal attempt. Now Lachlan Coote is thwarted but the ball is worked back to the middle. THURSTON HAS WON THE MATCH FOR THE COWS!! The Cows are going absolutely bananas. The crowd is going absolutely bananas. Old mate and his Dad are gooooone. I’m still going bananas. What a game. It feels like the best game ever but even at this very moment I am thinking I wonder how this game will age. 1989 Balmain vs Canberra and 2007 Manly vs Newcastle pop into my head straight away as worthy contenders for best game ever but we will save that discussion for another day. We stay for absolutely every word spoken and the lap of honour before heading out of the stadium. I think both teams conduct themselves admirably post match and totally agree with the new stadium for Townsville. Once outside we try and get food from the massive food festival just outside the ground but we can’t find any cash in our wallets and no-one has EFTPOS facilities so we chalk it down as lessons learned and forlornly walk back to our car. Now I’m super pumped that we parked right beside the ground. We literally get back to Bass Hill in 20 minutes. Awesome. I watch the last 20 minutes of the game on Foxtel and then go to bed. We get up before the sun and chat to another family who is leaving at the same time. Cows supporters from the Goldie. They are trying to squeeze four people and a lot of luggage into a normal size car. They jokingly ask if we can take their kids or some luggage. We all have a good laugh and banter about the game. Everyone is still pretty pumped. The rest of the trip is pretty uneventful really. When you leave on a super impromptu spontaneous weekend to watch your team play in the GF and it is an 11 ½ hour drive home it is safe to say that your more excited on the way down. It did give me lots of time to consider whether the Cows could win back to back premierships in 2016. I think they can. Bring it on! 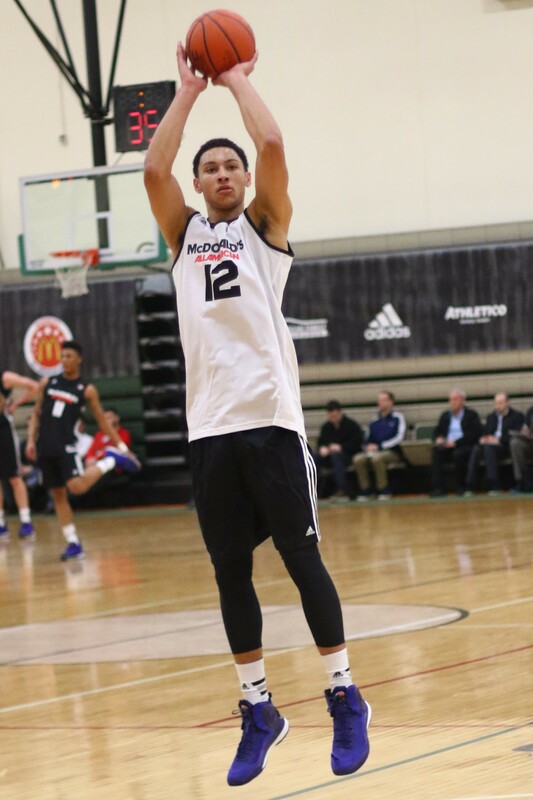 Ben Simmons. I’d read a lot of stuff about Simmons and seen a few things on Youtube but we don’t get a lot of Montverde Academy games in Australia so his first game for LSU is the first real opportunity I’ve had to see him play. He is from another planet. He really is a Point Forward. His passing game is unbelievable. Just saw the highlights of the game against Kennesaw State. It is true that conference play will be a lot more challenging but hard not to get excited about his potential. Really missing the Jarryd Hayne watch. Hurry up and play him again San Fran. Really hoped the WACA would provide a result but the pitch was an autobahn.